Why purchase a single recreation room game when you can get two for one? Keep in mind that far too many hybrid products that promise to deliver various options or set-ups end up providing at best mediocre results in any configuration. That’s not to say that creating a usable and easily convertible hybrid item is not possible. In fact, Hathaway’s Maverick pool and table tennis table combination does a decent job of giving recreational players the choice to shoot billiards or play ping-pong. This is a compact pool table (it measures a little over 6 feet by 3 feet) that comes with two MDF boards to place on top of the frame that then allow users to play table tennis. The size means the unit can be placed in smaller playing areas. Converting to table tennis play is simple, and the table tennis playing surface measures 84 inches by 46 inches. Lay them atop the pool table, add the nets, and get ready to play a different game. Pool tables, by nature, are pretty substantial. 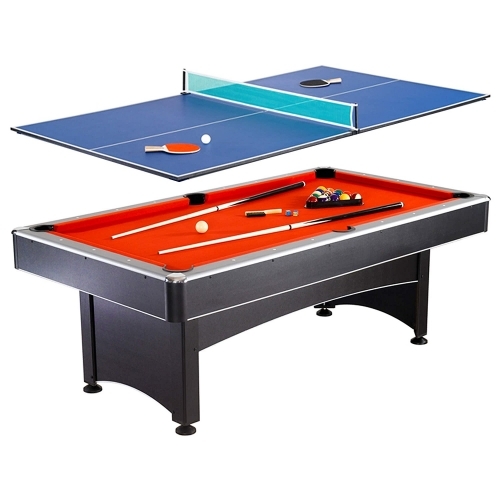 A solid frame is essential for a good game play in pool and in table tennis, and this table rests on large pedestal-like legs. Many portions of the Maverick table, which including outer surfaces, the felt covered pool playing surface, and the table tennis surface are made from environmentally friendly CARB certified MDF (medium density fiberboard). You might wonder why this is important. CARB stands for California Air Resources Board. CARB works to reduce airborne toxins, including formaldehyde emissions from composite wood products, which is a good thing. MDF is a reliable and sturdy building material as long as it is protected from wetness, but keep in mind that most higher-end tables use slate to ensure smoothness. Other pool playing enhancing features are white inlay sights for lining up bumper shots. However, for table tennis players, what might matter most is the stability and construction of the table itself. The outer matte black melamine surfaces are made even sturdier with molded ABS corner connections. ABS is a thermoplastic polymer that stands up to a lot of use (and abuse – it’s what Lego building blocks are made from). 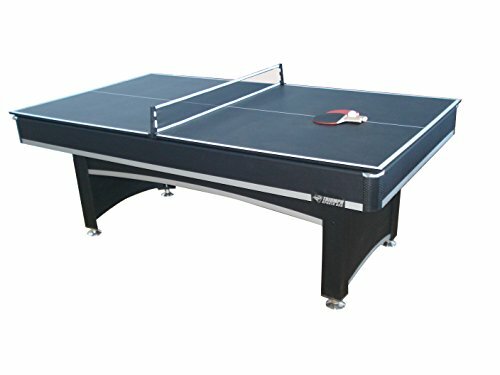 The table tennis top is constructed from ½-inch CARB certified MDF that has been coated with a blue laminate. Its edge trim is black. Most people find the Maverick reasonably easy to assemble, taking a little over an hour for one person to put it together. Assembly consists of attaching the legs and side aprons with bolts, attaching the leveling feet, and then turning it upright. The key is having all the right pieces packaged in the box. Once properly assembled, however, the table is sturdy and other than being a bit heavy, putting it together is a manageable one-man project. In terms of looks, the table is not bad. The legs and side apron have a nice arching detail. The top rails (the area surrounding the felt playing surface) is silver toned laminate. The corners are set off with chrome-plated caps. The overall feel of the table’s styling is modern, but it is not, by any means, a high-end look. However, it includes leg levelers, which are essential to achieving an even playing surface no matter how level you think your floors are. Hathaway even includes the cues, pool balls, net and paddles for both games. This is a “you get what you pay for” item. It is nowhere near regulation size and still requires a fair amount of space to play. In terms of the pool-playing surface, the gum rubber bumpers may lack accuracy in rebounding shots and as a result, pool shots may lose speed. The felt on the pool table covers a slab of MDF, and the table tennis top is made from laminated MDF. While MDF is generally a decent building material, watch out if it gets wet. From swelling to stained felt, liquid poses major problems. If you allow liquids into your game room (and who doesn’t?) have cleanup materials at hand to handle any spills. Putting the Maverick together is simple IF all the proper parts are included (missing and damaged items seem intrinsic to just about any product requiring assembly these days). Additionally, the felt on this table may be a bit on the thin side, so users may want to take extra care when installing and removing the table tennis top so that it does not inadvertently damage the felt.